Southern Living is a staple in the TIME Inc. publishing portfolio, with a circulation of 3MM readers, all with tremendous Southern Pride. 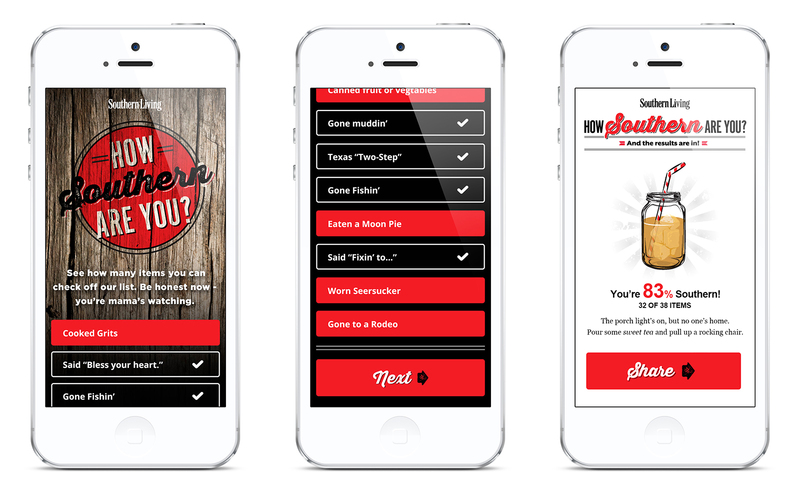 To increase engagement and reach new readers, Southern Living tasked Socialtyze with creating an interactive social experience centered on things that are quintessentially southern, such as crawfish, Johnny Cash and biscuits made from scratch. 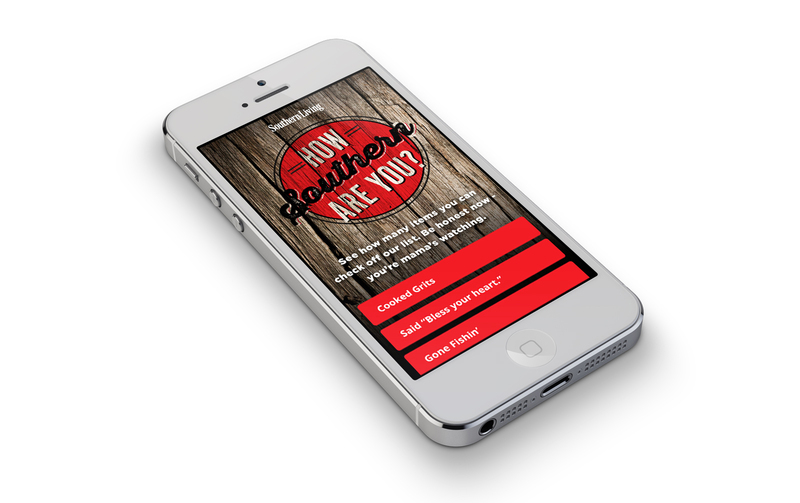 Socialtyze built an app with a simple user interface, both desktop and mobile compatible, allowing users to fill out a checklist that ranked their “Southern-ness”. There were 36 possible checklist items, ranging from the mundane – “Own a Johnny Cash album” – to the all out hillbilly – “Gone muddin” and “Sampled homemade moonshine”. Upon completion, the user’s “How Southern Are You?” ranking was displayed using mason jars of sweet tea as the indicator of how far below the Mason Dixon line they belonged. After the checklist was completed, we gave users several reasons to stay engaged. We created a leaderboard featuring their friends’ scores with the added ability to challenge a friend using the Facebook share API. 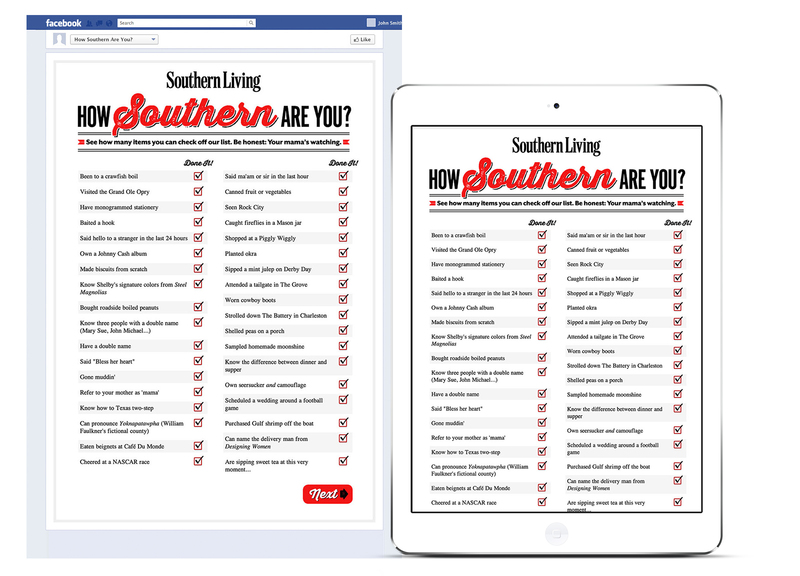 We also teased exclusive content only made available if the user had “Liked” the Southern Living Facebook page. One of the highlights of the campaign was its strong mobile presence – over 55% of the usage came from users on mobile devices. We also delivered 300% of the client’s total campaign goal in the first weekend alone, a win some may say is sweeter than Grandma’s homemade cobbler.